The imposing exterior of the London and South Western Railway Company's Friary Station. © Locomotive and General Railway Photographs. Friary Station, adjacent to Beaumont Road and Friary Green, was the Plymouth terminus of the Southern Railway main line from London Waterloo, a distance of 234 miles. It was controlled from Friary "B" Signal Box. The London and South Western Railway Company had reached Plymouth in 1876 and planned, in conjunction with the Sutton Harbour Improvement Company, to open a branch to a station at Friary and onwards to Sutton Harbour. However, the Great Western Railway Company delayed adding a narrow gauge rail to their broad gauge line and the plan was the subject of much legal argument. 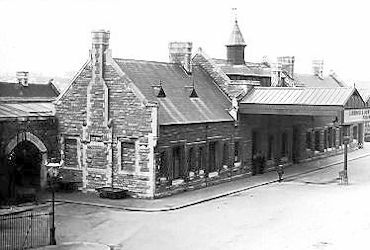 Friary was first opened for goods traffic only on Friday February 1st 1878. There was no provision for passenger traffic although the 13 acre site allowed plenty of room for expansion when such a facility was authorized. The design of the goods shed was the same as that at the Devonport Station terminus, except that it was built in brick instead of stone. The shed measured 201 feet by 101 feet and was accessed by means of a roadway of granite blocks from Exeter Street. There was a weighbridge just inside the entrance. Platforms of 20 feet in length were placed either side of a single line of rails. There were six cranes. Two further lines led into an engine-house (loco shed), which measured 100 feet in length by 33 feet in width. All the work was carried out by Mr Relf and commenced on May 8th 1875 with the construction of the eight arch span bridge carrying the Tothill Road over the railway. Mr Relf's local superintendent was Mr Popkiss and the clerk of works was Mr Waymouth. The 7.30am goods train from Exeter to Devonport was henceforth to run in two parts and would be split at Laira Junction, one going to Devonport and the other to Friary, where it was expected to arrive at 11.08am. This would bring the freight traffic from London. A new service was booked to leave Exeter at 11am and after stopping at all intermediate stations was due to arrive at Friary at 5.52pm. Two goods trains would leave in the Up direction, the first at 4.35pm. This would be joined at Laira Junction with the 4.45pm from Devonport for its onward journey to Exeter. At 8.45pm the all stations goods train would leave for Exeter, where it was due to arrive at 2.05am the following morning. Friary passenger station was built by the London and South Western Railway Company as the terminus of its route from Lydford through Tavistock, Bere Alston, Saint Budeaux and Devonport, and was officially opened on Tuesday June 30th 1891. Passenger traffic began the following day, Wednesday July 1st. The first Friary Engine Shed was opened at the same time. The section of track between Lipson Junction and Mount Gould Junction, however, belonged to the Great Western Railway Company. waits in the bay platform (right) at the head of a local to Turnchapel. The Up, or Departure Platform, was on the side of the main buildings. The Booking Hall was entered through one of two doors beneath the exterior canopy. On the left were the Police Office and Inspector's Office, while on the right was the Refreshment Room. To the left of the main entrance were the Ladies' Waiting Room, with toilets, and General Waiting Room, at the rear of which was the Ticket Collectors' Room. Next to the Refreshment Room was the Parcels Office, with the counter being accessible from both outside and on the platform. The Gents' Toilet and the Lamp Room completed the building. There was a Bookstall on the Up Platform, beneath a two-faced Station Clock. Two sets of gates gave access to the Departure Platform, the Fish Gates nearest the buffers and the Luggage Gates just below the covered Footbridge. The Down Platform had Ticket Gates at both the concourse end and at the bottom of the Footbridge stairs. The Assistant Superintendent and the Station Master had their small offices on the Down Platform, alongside the Porters' Room and a Guards' Room. At the Footbridge end of the block was a Store Room and at the concourse end was another Gents' Toilet. In addition to the main two lines, there was a Middle Siding, Up and Down Bays, used by the Turnchapel Branch trains, and a Scenery Dock, where the scenery for the New Palace Theatre of Varieties and Theatre Royal were unloaded off wagons. This Dock was also used by Circus Trains. Friary Station also became the terminus for the Turnchapel Branch from its inception in 1892 and the Great Western Railway's Yealmpton Branch trains from November 3rd 1941 when they were transferred here from North Road Plymouth Station. On Wednesday September 26th 1906 a new suburban service was inaugurated between Devonport and Saint Budeaux only. There were eighteen trains in each direction on weekdays and eight on Sundays. This service was extended from Devonport to Friary Station from Monday October 1st 1906. For the train departure board in operation for the main line on weekdays and Sundays and the Turnchapel Branch on weekdays only (there was no Sunday service on the Branch) from June 7th until September 30th 1914, or until further notice, click HERE. 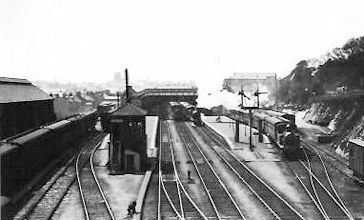 Friary Station was the scene of the arrival of the first hospital train carrying wounded soldiers from the Battle of Mons. The date was Sunday August 30th 1914. The train had left the docks at Southampton early that morning and was due at Plymouth at Midday. However, a slow journey and lengthy stops meant that the train did not arrive at Friary Station until 2.30pm. It was greeted by a large and cheering crowd and the local military top brass. A convoy of buses borrowed from the London General Omnibus Company, which had been converted as ambulances, plus private cars, conveyed the wounded soldiers to the temporary hospital that had been set up in Salisbury Road School. The press noted men from the Royal Engineers, the Royal Scots, the Royal Scots Fusiliers, and the Middlesex Regiment among the arrivals. In December 1931 the 3rd class return fares from Plymouth Friary Station were: to Oreston and Plymstock, 3d; to Turnchapel, 4d; to Devonport, 3d; to Albert Road Halt, 4d; to Ford, 5d; to Camel's Head Halt, 6d; to Saint Budeaux, 7d; to Bere Ferrers, 1s 6d; to Bere Alston, 1s 9d; to all stations on the Callington Branch, 2s 1d; to Tavistock, 2s; to Brentor and Lydford, 3s; to Bridestowe, 3s 6d; and to Okehampton, 4s 3d. First class fares were available to all stations except Plymstock, Oreston, Turnchapel, Albert Road Halt and Camel's Head Halt. During the Second World War Friary Station witnessed an exodus every bit as important as the arrival of 1914. On Saturday May 3rd 1941 a special train departed with 650 school children for stations in North Cornwall. It was not a school trip but the first evacuation. After the end of the Second World War, the Southern Railway Company introduced a new class of locomotive for passenger and freight work in the Westcountry. Weighing some 128 tons, this Pacific type had a tractive effort of 31,000lbs. It was aptly named the Westcountry Class and on the evening of Wednesday July 11th 1945 the Lord Mayor of Plymouth, Alderman H G Mason, named the third locomotive in the Class as "Plymouth" at a ceremony at Friary Station. It was watched by hundreds of schoolboys, who were eager to climb up into the driving cab afterwards. Representing the Southern Railway were the chairman, Colonel Eric Gore Brown; the general manager, Sir Eustace Missenden; and the chief mechanical engineer, Mr O V Bulleid. The Refreshment Room on the Up or Departure Platform had closed by 1950. According to the "The Official Hand-book of Station 1956" Friary Station dealt with goods traffic, passengers, parcels, miscellaneous traffic, furniture vans, carriages, motor cars, portable engines and machines on wheels, live stock, horse boxes, prize cattle vans, and carriages and motor cars by passenger or parcels trains. It was equipped with a crane capable of lifting 7 tons 10 hundredweight (cwt). Friary Station was closed from Monday September 15th 1958 so that it could be converted into Plymouth's main goods station. It became the City's main marshalling facility after the closure of Tavistock Junction Marshalling Yard on January 4th 1973. The site was turned over to housing and a small industrial estate in the 1980s.